When should you arrange your kids first dentist visit? This is a question nearly all moms ask me! Introducing the dentist for the first time can seem worrying, but it need not be! I usually recommend bringing your kids along as toddlers, to your own dental check-up appointments. Say from the age of around 2 years old. At this age, they can just see what a dental office looks like, and see what happens at a check-up visit. After a couple of visits, they get used to coming along, and don't see it as anything bad! If you start off early enough, and make sure that these visits are fun and non-threatening, your kids should be happy enough to have their own teeth looked at from the age of 3 or 4 years. Something that I recommend very strongly is talking to the child about their upcoming visit to the dentist. If you take some time each evening at bedtime, for several days before the actual appointment, you can describe what the experience is going to be like. Sometimes, however, kids can be apprehensive about visiting a dentist. Maybe they had a bad experience as a result of an accident, or they have heard adults talking about dentists in a negative way. Then we need some extra help! One idea that really seems to be effective is using a BIG plush toy animal as a "buddy" for the child. The most popular ones are from a company called StarSmilez. Here's a picture of Barney! By focusing the child's attention on a big colorful character rather than the dentist, they get a chance to get used to the surroundings. We tell the child that Barney loves coming to visit us, and we play some games together! We show the child what we do for a check-up by doing a "pretend" check-up on Barney. We show them how the little mirror works, and we vacuum up a little water from Barney's mouth to make that "sucking" sound. We let the kids have a go, too. They love it! Now it's the child's turn to have their own check-up. We usually let them hold Barney during the exam, so they feel they have a new buddy with them. Once a child is comfortable getting their teeth checked, Barney has another job to do! With his big teeth, it's great for showing kids how to brush their teeth. They can see clearly exactly where the toothbrush should go, and have fun brushing Barney's teeth for him! 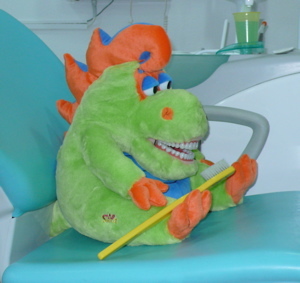 If your dentist does NOT have a large soft toy like Barney, WHY NOT TAKE YOUR CHILD'S OWN FAVORITE cuddly toy from home? This will be a character that they are familiar with! ALTERNATIVELY, you could get your own "Barney" as a special new soft toy to do with teeth! I really like the crocodile character from Amazon - here's the link! If you are thinking about your kids first dental visit, ask your dentist if he uses any toys or characters to help with that all-important first introduction. Once you find out what toys, characters and procedures he uses, you can build that information into your stories that you tell your child before the actual appointment. Then, your child will know what to expect, and will gain a lot of confidence when what you have told them comes true. If your dentist does NOT use any toys, characters or special procedures for a kids first dentist visit, maybe look for an office that does!